At Dr. Dish Basketball, we take pride in working with hundreds of basketball coaches at all levels around the country and the world. Recently, we were able to catch up with Brian Gregory, the Head Men's Basketball Coach at the University of South Florida. Coach Gregory has had a great head coaching career with Dayton, Georgia Tech, and now University of South Florida. Last season (17-18) was the first year Coach Gregory took over and has already surprassed the the number of wins this season (USF finished 10-22 last season and started off 12-3 this season). While we can't take ALL of the credit ;) - it's great to hear that the Dr. 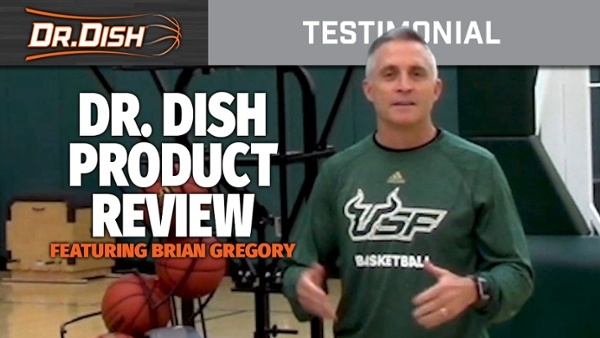 Dish All-Star has played a role in accelerating the skill development in the program. Check out what Coach Gregory has to say below! It's great to work with programs like University of South Florida. Initially, a few years ago, we partnered up with the Women's program and Coach Jose Fernandez. Coach Gregory and his staff noticed how much the Women's team enjoyed their Dr. Dish so they wanted to hop on board. We look forward to following the progress of both programs at the University of South Florida this season and beyond!